When you play a character as believable as Steve Urkel, it is easy to get typecast as an actor in hollywood. The high pants, “nerd” glasses and nasally voice make it difficult to see Jaleel White as anyone else. Even himself. Unfortunately, typecasting doesn’t only occur in the world of acting. The same could be said for some of our favorite NBA stars. For instance, San Antonio Spurs small forward Stephen Jackson has established himself as one of the more unique talents in the NBA. As a big man who possesses a perimeter game, Jackson still plays with a toughness rarely attributable to a small forward with almost two hundred 3-point attempts per season. These are all the things you will hear about Jackson around this time of year because Jackson happens to be an incredibly important role player in the Championship-hopeful Spurs locker room. If you are unfamiliar, the Spurs organization is one of the most stable and dependable that you will find in the league. It is on this kind of team where players like Jackson can maximize his talent and almost never become the distraction they would become on other, less stable teams. I introduce the ‘Good Teammate Theory’. While many players in the NBA have been typecast as “bad guys” at one point or another in their career, there are a couple of important factors in making that declaration. It is widely believed that children with behavioral problems crave and need structure to maximize their potential. It might not be a stretch to say that adults, including some of the most athletic freaks walking the planet, may crave the same things in order to maximize their potential. The NBA is dripping with newly christened millionaires who often display questionable judgement and can definitely lack discipline at times. However, there are times when this player (i.e. the NFL’s Randy Moss) has all the talent in the world and is placed in the team structure to deter him from losing focus. It is in these situations when the player is determined, in line with the teams mission, and there isn’t one story written about this player being a ‘distraction’. 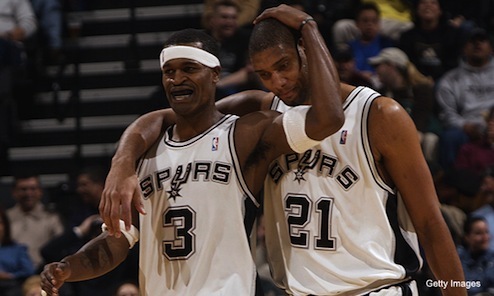 So when future Hall of Fame power forward Tim Duncan, refers to @DaTrillStak5 as “the ultimate teammate”, more than a few eyebrows were raised. Jackson’s case does not stand alone. It only takes a look back over the career of Defensive Player of the Year Tyson Chandler to see a time when he was labeled as a ‘bad guy’ before his days with the New Orleans Hornets. Since then, Chandler has been known as the defensive catalyst for each team he has played for including his 2011 champion Dallas Mavericks. Even the most recent example of a player that has developed a laughable reputation, Javale McGee, is a prime example of this theory. On the Washington Wizards, Mcgee was a fixture on sports talk radio and television shows regularly displaying his mistakes and follies on the court. It wasn’t until a midseason trade with the Denver Nuggets where McGee, under the tutelage of George Karl, began to show flashes of competency at the center position. Players take time to develop once they get to the league, but also need time to develop as men. Many of them spend a couple of years discovering their NBA identity’s. This takes a bit of trial and error and can lead to some being deemed ‘bad guys’ in the process of growing in the public eye. One factor is not going to change: writers and guys like me will never stop hyper-analyzing them as they grow in front of the camera. But thank God I didn’t have to grow up in front of one. Completely agree. 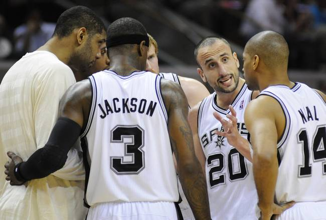 You have to respect the Spurs’ mentoring and tutelage of the players. I think this translates to a few other sports too (see New England Patriots) I also dont think it’s a coincidence that these teams are perennially successful. Well written, sir. Now if only we could get some “good teammating” in ATL. I totally agree, nice segway with the Urkel reference too. It stinks when players are typecasted in the league. Stephen Jackson, McGee and some others maybe like a Monta Ellis just need certain environments to play in where they can be respected for their “personality” presence instead of their game being correlated to their attitudes. I believe if JR Smith was on the Spurs he wouldn’t have this bad rep he has either. Great post!